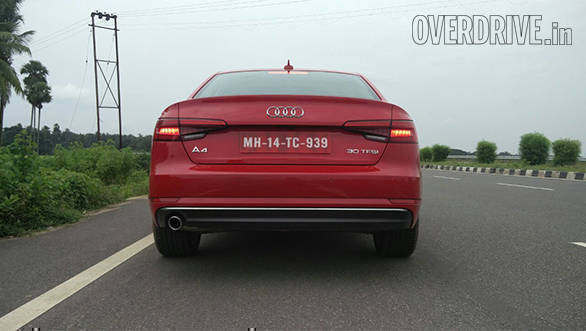 When the Audi A4 B8 initially came to India in 2008, the competition knew there was something to worry about because it was far ahead of its time. While that was true initially, the lack of a complete revamp for seven years gave its competitors sufficient time to outdo almost everything Audi had managed. 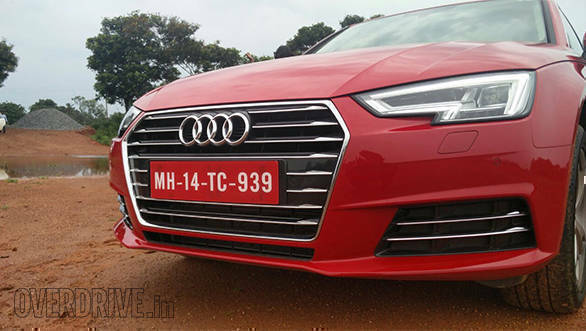 However, at the 2016 Auto Expo Audi promised us the much needed update, and finally here it is - the 2016 Audi A4 B9. Audi has been making bold claims that this will set the benchmark in this segment with first-in-class features. 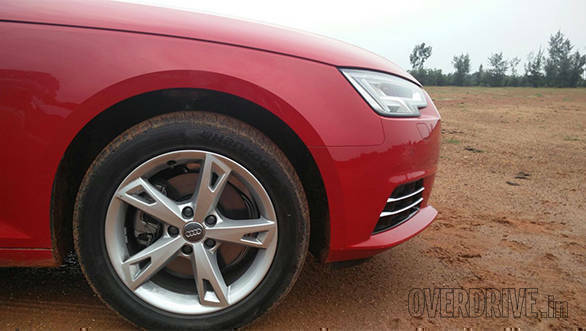 We're in Bhubaneswar, Odisha, to find out if Audi's claims hold true. The Audi A4 is certainly a very handsome car with the sharp lines running all around, and there really isn't any angle from which it looks bad. It's almost like a well-built person dressed in a sharply cut suit (a bright red suit in this case). The new large hexagonal grille adds quite a bit of presence, while the edgy headlights with the dual DRLs and the large airdams add to the aggressive look of the front end. There's also just the right amount of chrome to give it a subtle yet premium look. From the side, however, the Audi A4 does seem a bit bland with the simple straight lines. But that doesn't necessarily mean it's bad. The long, straight shoulder line, which extends all the way from the front to the rear, accentuates the length and the width of the Audi A4. The 17-inch wheels meanwhile, look rather unique and should be very practical with the 225/50 section tyres. The rear end has a few more character lines running across the bootlid and bumper, while those sweeping LED indicators have always managed to fascinate me. Overall, the Audi A4's exterior might be a bit too conservative not only for my liking but also for a market that's looking for something unique. While this design might work well in European markets, the Indian buyers are usually looking for something a bit more flamboyant. That said, I still stand by the fact that the Audi A4 is a very handsome car. The all-new interior, however, has to be the most impressive change to the A4's design. Unlike the outgoing model, it has a very modern design which looks unlike the other Audis. It features a very premium looking dash and centre console, garnished with dark brown wood trims. Running all across the dash are AC vents which seem like they're connected to give a nice flow to the interior design. The quality of materials is really great and the attention to detail makes the entire cabin a very nice place to be in. A nice feature that's available on the new Audi A4 is the virtual cockpit, which is essentially a fully digital instrument cluster. Apart from displaying the speed and rpm, the unit can also be a set to display navigation and infotainment data. Additionally, it gets the updated MMI system which has a better user interface and gets the touchpad rotary dial from the more premium Audis. Located under the front armrest is a small storage space and what Audi calls a phone box. It serves as a safe space to store your phone (an iPhone 6 Plus fits comfortably on it) and also wirelessly charge it if your phone supports the feature. What's most impressive though is the amount of space available for passengers. I'm six-feet tall, and with the front seat adjusted to accommodate me comfortably, there was still decent amount of knee room for the rear passenger. While the front seats are comfortable with sufficient bolstering, the rear seat, if I had to nitpick, could have done with better under thigh support. The boot, however, isn't too broad or deep but has decent length. The Audi A4 will initially be sold only with the 30 TFSI 1.4-litre turbo petrol engine. For most people, it might come as a disappointment that Audi has ditched the 1.8-litre turbo petrol for the more frugal option. However, on the first impression, you really don't miss the bigger engine. The new motor produces 150PS of power from 5,000-6,000rpm and 250Nm between 1,500-3,500rpm, all of which is delivered in such a linear manner that you sometimes forget it's a turbocharged engine. 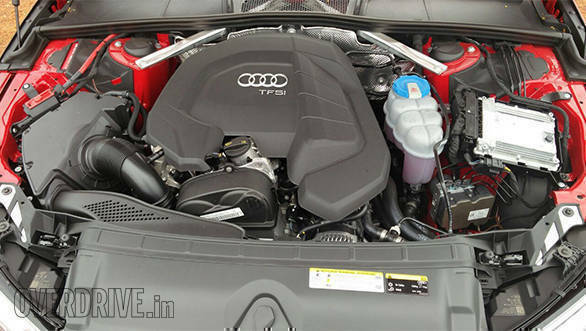 In addition, Audi is claiming a fuel efficiency of 17.84kmpl, which is 2.2kmpl more than the outgoing version. 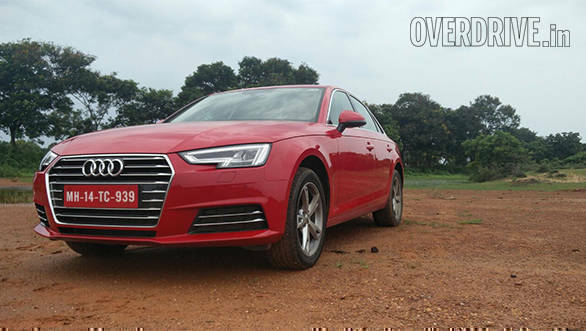 While the Audi A4 now makes 20PS less power and 70Nm less torque, Audi still claims that it's just 0.2s slower to 100kmph than the outgoing model at 8.5s. But only a thorough road test will establish that. The best part about the Audi A4 though isn't how quick it is, but how composed and effortless it feels to drive. It's not very aggressive to drive, and that really goes with the overall appeal of the car - calm and composed. In Comfort mode, the throttle feels a bit dead, which is nice for driving in slow-moving traffic, but not suitable for driving on the highway. Switch to Dynamic mode though, and the exhaust note gets a bit louder while throttle response is sharper and the transmission shifts up later. The 7-speed DSG otherwise quietly does its job and shifts smooth enough for you not to notice a gear change. 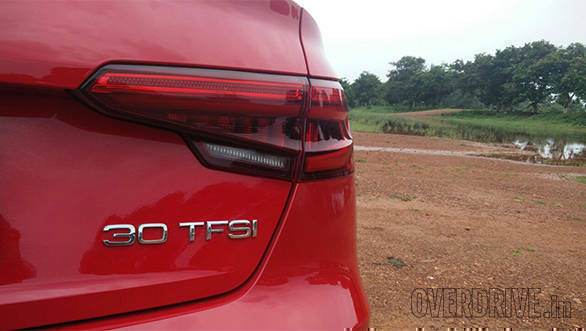 However, if you're still not convinced by my arguments for the 1.4-litre TFSI, you could always wait for the 2.0-litre turbo diesel variant, which Audi will launch soon after. The first thing you'll notice once you get behind the wheel is how supple the car feels. It soaks up bumps really well and none of the 'thuds' are transferred into the cabin. 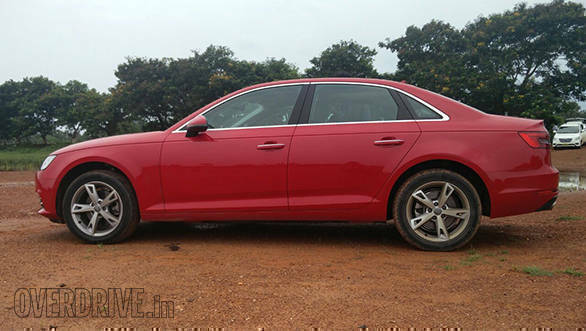 In fact, we think that the new Audi A4 could have the potential to offer the best ride quality in this segment! But again, only after a thorough road test and comparison, can we decide on that. For now, we'll just say that the ride quality is very impressive. Unfortunately, we didn't get the chance to thoroughly test how the car handles because of the long straight roads surrounding Bhubaneswar. But from the few corners that we managed to through the car at, we were quite impressed. The suspension seems to be set up to offer the perfect balance between comfort and handling. The car is quick to change direction and has a very sharp turn in, thanks to a precise steering. There isn't too much body roll either, and the Hankook Ventus S1 tyres keep the car stuck firmly to the road. Additionally, the brakes are pretty effective and more progressive than sharp. If I had to nitpick though, the steering could have done with a bit more feedback from the road. But otherwise, it's quite dynamic and very comfortable to drive around town in Comfort mode. While the steering does weigh up at higher speeds, we liked it best when we set it to Dynamic mode where you immediately get a noticeable difference in weight and precision. All in all, the new Audi A4 is certainly a huge improvement over the outgoing model. It looks better, feels more modern and certainly drives a lot better despite running a smaller engine. While the 2.0-litre TDI variant is sure to be a stonker, the A4 with this 30 TFSI engine has us very impressed. However, as always, the most important factor at the end of the day for a customer is price. We expect the Audi A4's price to undercut the Mercedes-Benz C-Class and stay on par with the recently launched BMW 320i. Given that and the fact that it will be offered with at least two trims, the price could range between Rs 36-39 lakh. As far as Audi's 'best-in-class' claims go, we'll unfortunately have to refrain from making a decision until the road test. However, we will say that it certainly has the potential for it, and leave it at that.